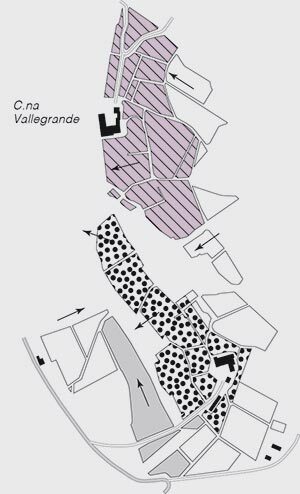 Valgrande or Vallegrande is a cru in the commune of Treiso, on land registry map sheet 2. The denomination corresponds with the farm of the same name, which in the mid-1800s was known as Cascina Viale, and was listed by Lorenzo Fantini in his “Monograph on Vinegrowing and Winemaking in the Province of Cuneo” as one of the locations dedicated to the vineyard. It is a medium-sized cru, with elevations varying between 270 and 400m a.s.l. The best areas for growing Nebbiolo are in the middle, facing from west to south-west. The northerly and north-westerly aspects – towards the Ferrere and Giacosa crus respectively – and the parts closer to the bottom of the valley are, on the other hand, more suited to other varieties, such as Barbera, Dolcetto and Moscato. Ca’ del Baio has a number of Nebbiolo vineyards on the Vallegrande cru, covering an area of 3 hectares in all. They face west, and produce the estate’s Barbaresco Docg Valgrande.